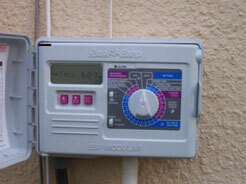 Irrigation systems are no replacement for good steady regular rainfall. 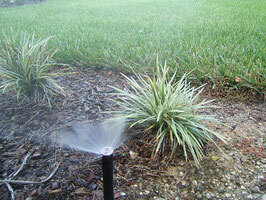 Unfortunately, they are not very efficient in getting water to the roots of grass and plants where it is most needed. As we know, water is costly so it is essential that sprinkler systems work as efficiently as possible. Make sure the water lands on your plants and grass and not on paved areas. In general, lawns only need ¾ inch of water in one watering session. This can be checked by placing empty cans or measuring cups around the yard. Turn on the sprinklers for 30 minutes and after the cycle has finished measure the amount of water collected in each can/cup and check to see that there was an even distribution of water in all receptacles, particularly at the extremes of the property boundaries. If the cans collected more or less than ¾ in then watering times can be adjusted so you are not over-watering. Remember that over-watering can also cause problems. A sure sign of over- over-watering will be the amount of dollar weed that appears in your yard! Ideally lawn irrigation systems should be checked at least once a quarter, assuming that easy access to the clock/timer and water is available. In between checks other signs may become visible that indicate a sprinkler problem, some of which seem obvious but include brown patches, grass is crunchy underfoot, blades begin to curl and wash-outs of sand or soil around sprinkler locations. Wherever possible spray should be kept away from walls as stains could appear on the walls and over time could penetrate into the rooms inside.